Friday was Graduation and the last day of school at Nishimachi. Eleven 9th graders graduated and each gave a speech in both Japanese and English to a gymnasium full of proud parents. The girls wore kimonos and the boys wore haori hakamas. Each one was so articulate and funny and poignant. 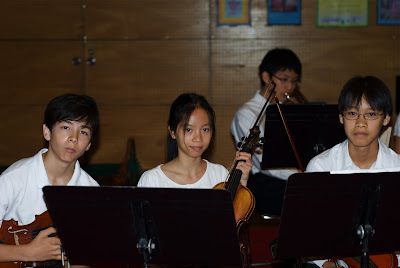 Yumiko played in the orchestra. Here she is with her classmates J.P. and Nicholas.